Photography is not a hobby. Updated CV and feedback request. Yesterday I asked over at FriendFeed for the feedback on my early attempt of making visual CV (big thanks to all who commented). Here’s a revised version that hopefully looks much better. The key to read the image above (click to see larger version) is as follows: Y-axis represents time (with dotted line indicating more or less the present moment); areas of interest are along X-axis; color of the phrases indicates my confidence level; font size denotes amount of time I spent on the topic (so in this case I have spent lots of time using perl, but I still don’t feel very confident about it); placement of the phrases denotes which areas of interest particular project/phrase spans; area below the dotted line shows my approximate plans and hopes for the future. The first version had “Photography” area instead of “Visualization”, but I needed to change that since it was confusing everybody and raised questions why I put a hobby on a professional CV. Photography (or visual arts) is not my hobby. My hobby is choir singing (which I do for over 14 years already, currently singing jazz and gospel). Visualization/Photography is there to indicate that I consider data visualization one of the most important elements of scientific method. What I’m trying to figure out is what kind of presentation can help us in understanding really complex systems, such as human (genetic, to make it easier) diseases. And when we understand them curing is going to be much easier. At least I hope it will. Anyway, the true reason to post it is to ask my readers for feedback on missing elements of my plans. So far my ideas for the future research projects split into a few paths. First path is to work further on bacterial systems (or subsystems, such as secretion systems etc.). This work would translate later on into something I call Synthetic Biology Framework, which would be a tool helping in designing new biological systems, and maybe later would result in creating a programming language for a cell. My first ideas about the framework were to design engineered bacteria producing some important compounds, maybe drugs, but now I think the cooler use for the framework would be to design bionano machines. The second path is about modelling of human diseases, with important milestone which is analysis of human genome and metagenome (genobiome as I call it) – if the data will be available. Because I don’t think I could do better here than thousands of scientists if I were using the same information, here’s a moment where synthetic biology comes into play again – I hope that I could design nanomachines that would server as quick diagnostic tools or would be reporting the body state in some mostly non-invasive way (aiming at issue of “how is my cholesterol level building up”). The third path is mostly empty and concerns visualization methods. So far I have no clear idea how to build a system that would visually assist in understanding how cells work. I plan to experiment with 3D printing and 3D visualization of biological networks, but I have no clear idea where this will lead me. 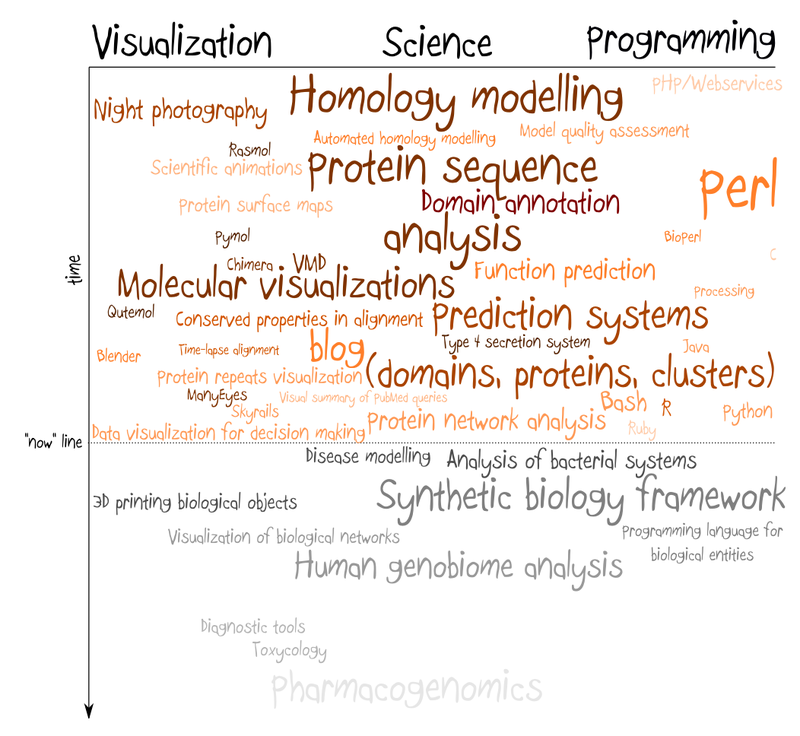 So if you have some opinion, comment, idea how to connect some dots, how to jump from one area to another (for example I have no yet idea how to approach pharmacogenomics), or if you think that it doesn’t make sense at all feel free to comment.